Happy Thanksgiving! I'm about to rush off to family dinner where we're having pizza instead of turkey, and no pumpkin pie, but that's really fine with me since I don't actually like pumpkin pie. I do like turkey, but what a lot of work. Maybe next year. 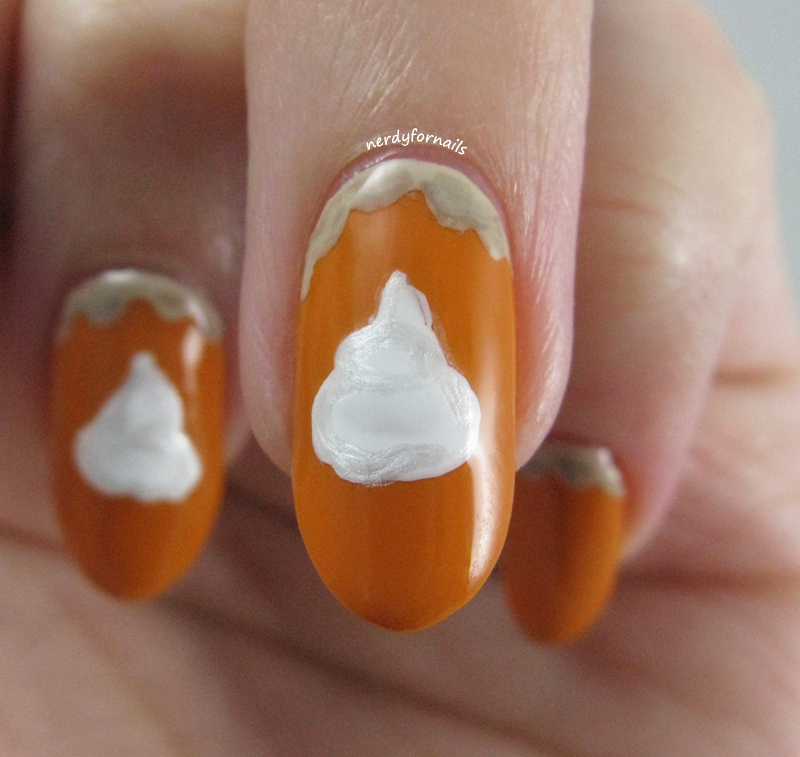 I think it looks much tastier on my nails than my plate. My favorite is chocolate silk and homemade whipped cream. Do you have a favorite/least favorite pie? 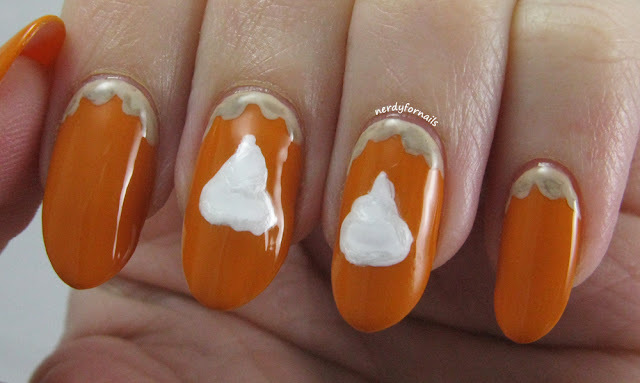 I found this perfect pumpkin pie shade- Spat! from LA Colors recently at Dollar Tree. I'm usually really impressed with these polishes for the price, but this one had a terrible formula. It was really streaky and took 3 coats to cover completely. It dried with a slightly matte finish like a neon, but did dry reasonably fast. My pie crust is Finger Paints, Don't Make A Scene with shading in Spoiled, Pumping Gas. The whipped cream is Sinful Colors, Snow Me White with Spoiled, Pearly White Teeth accents. This weekend Eugene hosted its first Comic Con in 10 years. What a lucky coincidence that we just moved here right? I actually hadn't ever been to a Con before, but very jealously look at pictures from San Diego every year wishing it wasn't so far/expensive/tickets sold out within 30 seconds of going on sale. 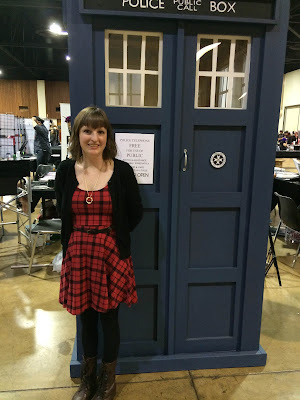 I think this smaller Con was a great first experience. I got to meet Vegas PG (she was awesome) and check out a lot of cool vendors. I didn't dress up this time, but you know at least my nails had to be in costume. I've been listening to the Harry Potter series on audio book the last couple months and right now I'm on the last one. I read all the books when they came out years ago, but it's been really fun going through them again. 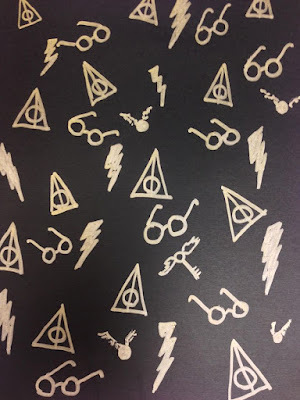 This cute little drawing of Harry Potter symbols was the perfect inspiration for the nails I painted for Eucon. 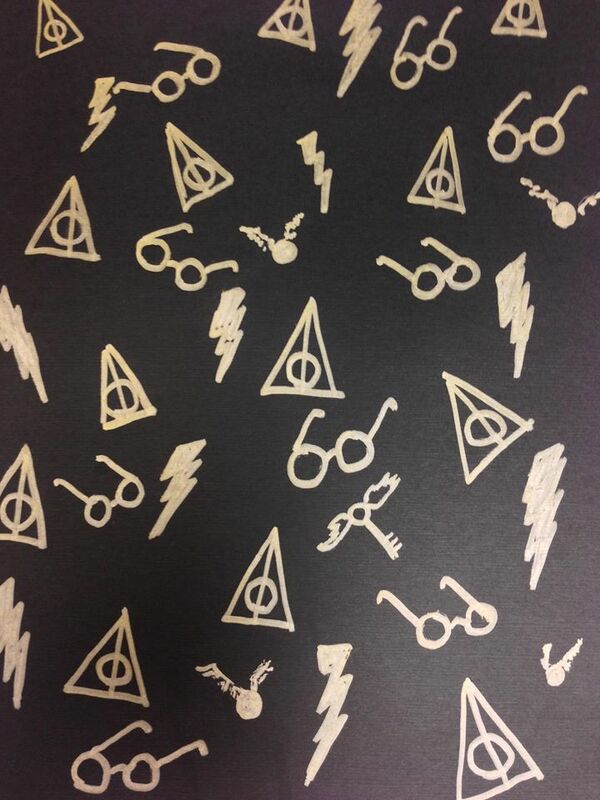 It's got little hallows, lightning bolts, Harry's glasses, golden snitches and flying keys. I started with two coats of 4 In the Morning from OPI which is a dark grey/black matte polish. 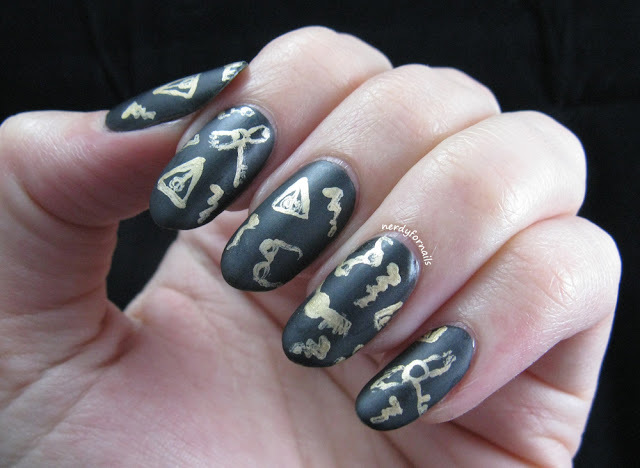 I used Sally Hansen Color Foil in Liquid Gold to hand paint the symbols, then finished it off with Wet n Wild Matte Top Coat for good measure. 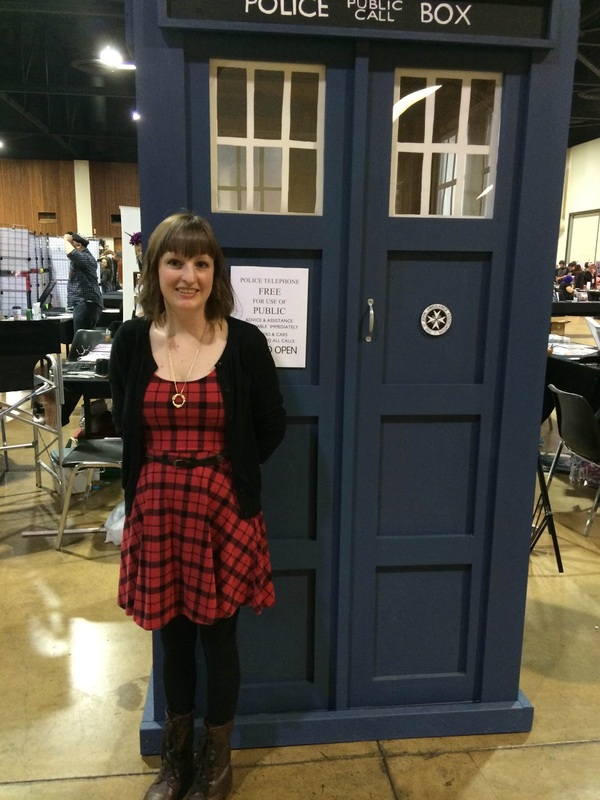 Here's a picture of me next to an awesome Tardis. I also saw lots of Doctors but unfortunately none of them offered me a ride. So I'll just keep on blogging for you all in the meantime. I'm really exited to check out some of the bigger cons in Portland next year. It's going to be really hard deciding what my next costume should be though. Today's nails were inspired by a picture. It's been cloudy and raining off and on all day so when I was complaining about not knowing what to paint, my husband suggested something to match the weather. Coincidentally one of my nail groups has a running inspiration challenge where everyone paints nails based on a picture. I love this picture and today was the perfect day to match it. I've been enjoying views of mist and clouds in the trees outside my window. Good thing rainy weather is my favorite because I think we're going to be having a lot of it for a while. I did a radial gradient in shades of grey for my misty background using Five Rules and Intelligence, Integrity & Courage from the China Glaze Giver collection and Your Turn from Sinful Colors. 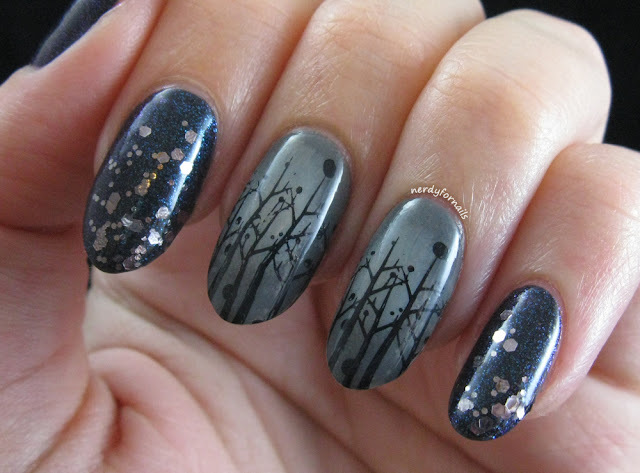 I used Bundle Monster plate BM-407 for the trees with Mundo de Unas black stamping polish and then topped it with a pale grey jelly that I frankened. 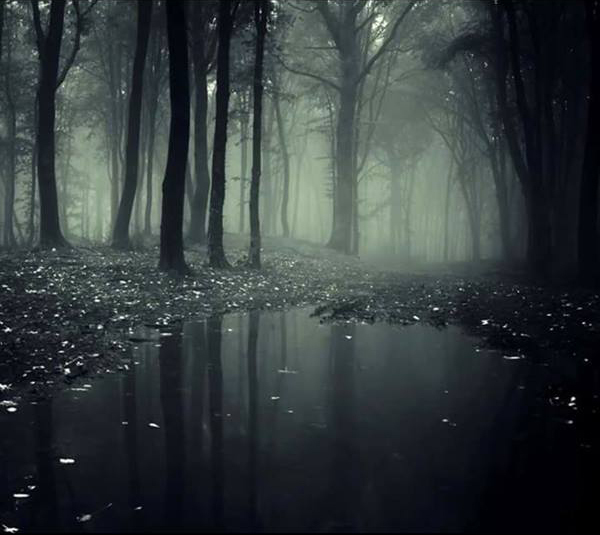 I don't think it shows up too much, but it was meant to give the trees a misty look. 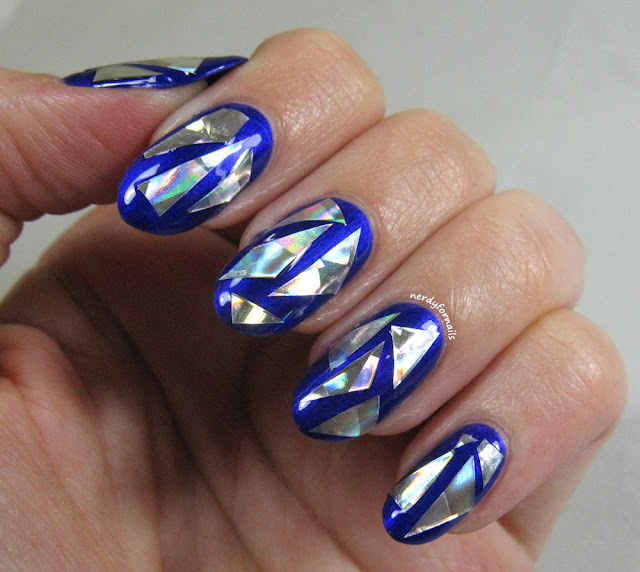 The other nails are two coats of Milani, Bella Blue. 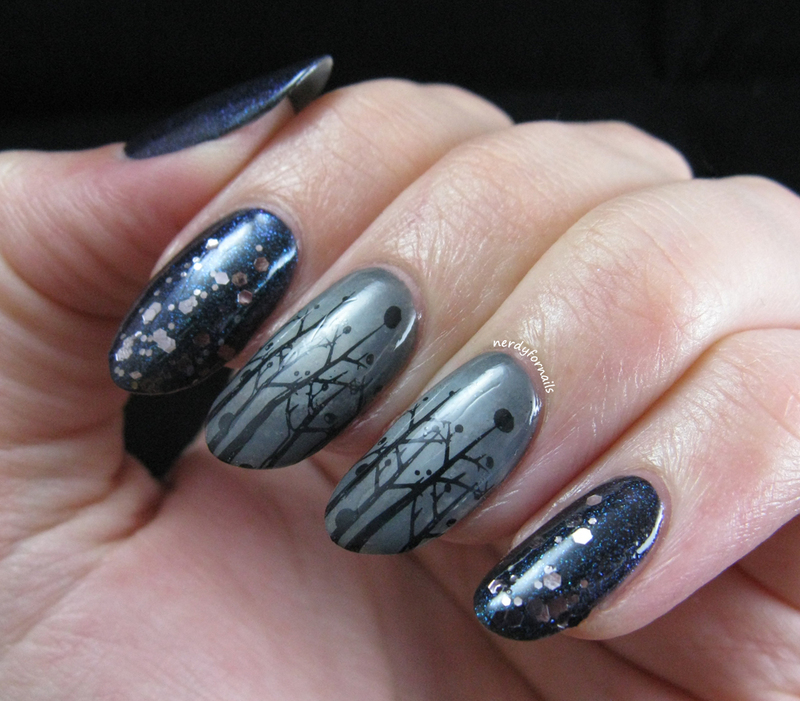 This one is a shimmer polish with a black jelly base which covers quite nicely in two coats. As you can see below the micro shimmer has a slight blue to purple shift. In regular light you mostly see a teal shimmer. 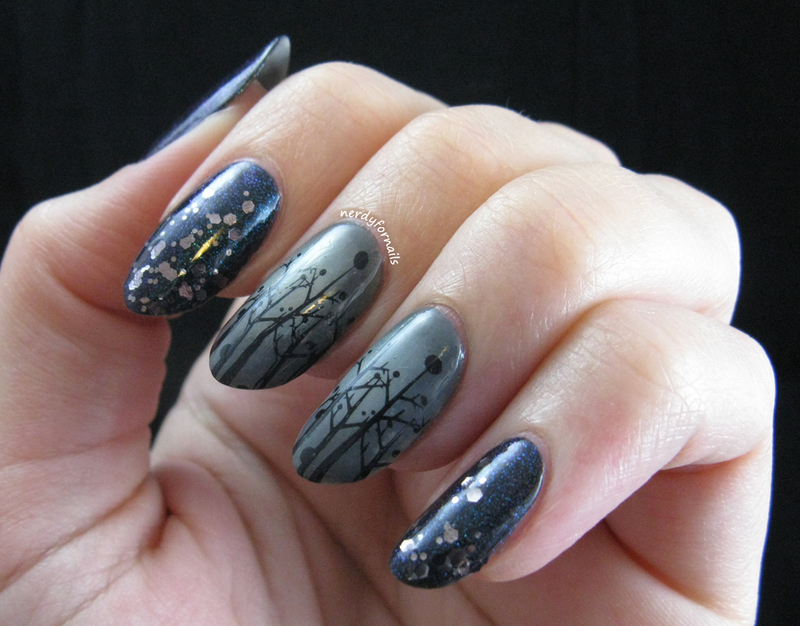 I added silver glitter (Atomic Splash by Orly) to look like the the wet leaves that are catching the light in the picture. 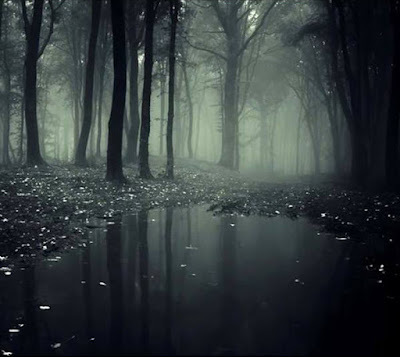 Overall I think this has the look of a dark misty forest. This was a really fun picture to replicate and now my nails go perfectly with the weather outside. I can't wait to enjoy them with the rain coming down outside all week. This broken glass thing has really been taking off lately. 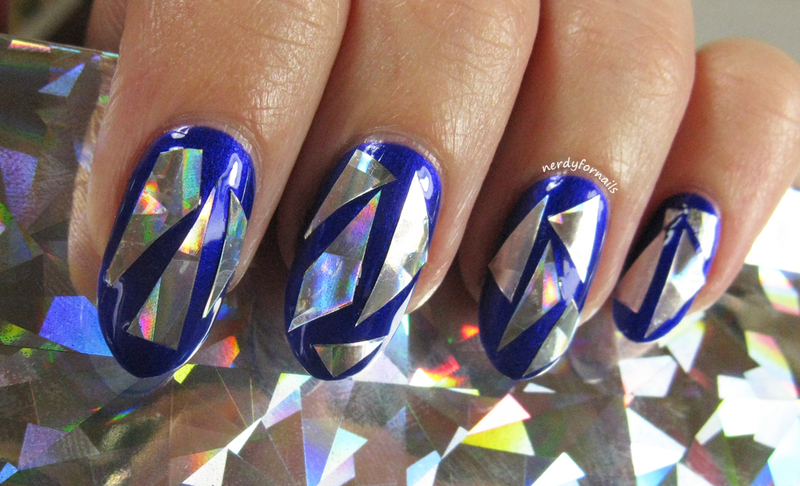 I'm not one to neglect the latest trends in nail art, so here's my version. This is actually a really easy and inexpensive look to create. I've been joking that I'm like a raccoon. 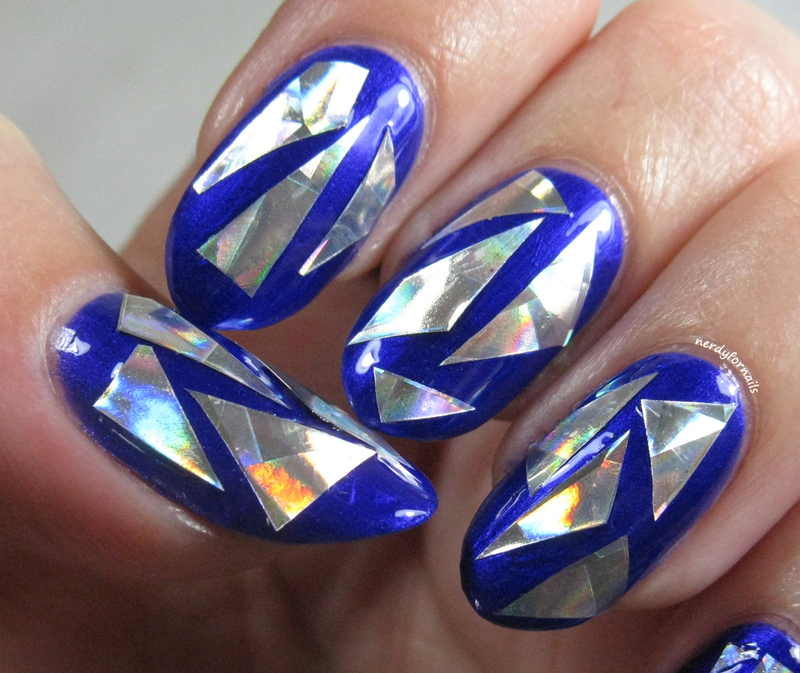 I can't get enough of the shiny bits stuck to my nails. It's very disruptive to my productivity at work. I started with two coats of Let's Talk from Sinful Colors. I'm kind of dying over how this polish is a perfectly rich shade of blurple- my most favorite nail polish color. 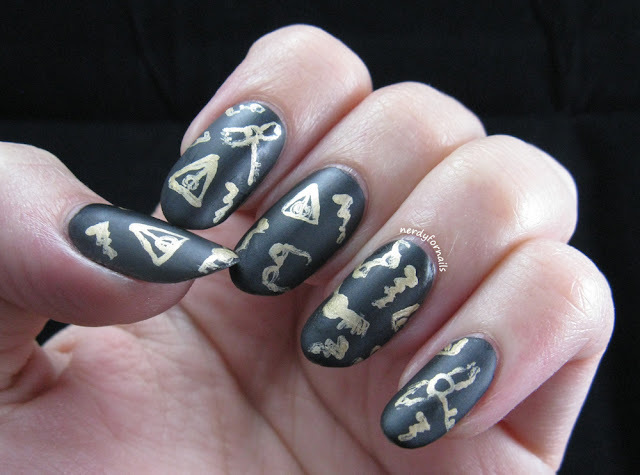 The formula was a little thinner than I like and wanted to pool at the cuticles, but it was workable. Totally worth it for how vibrant this color is. My broken glass is holographic cellophane from Dollar Tree. Each package comes with 4 large sheets, so I don't think I'll ever be able to use it all up. First, I top coated my base color so it wouldn't bleed up over the "glass" bits. 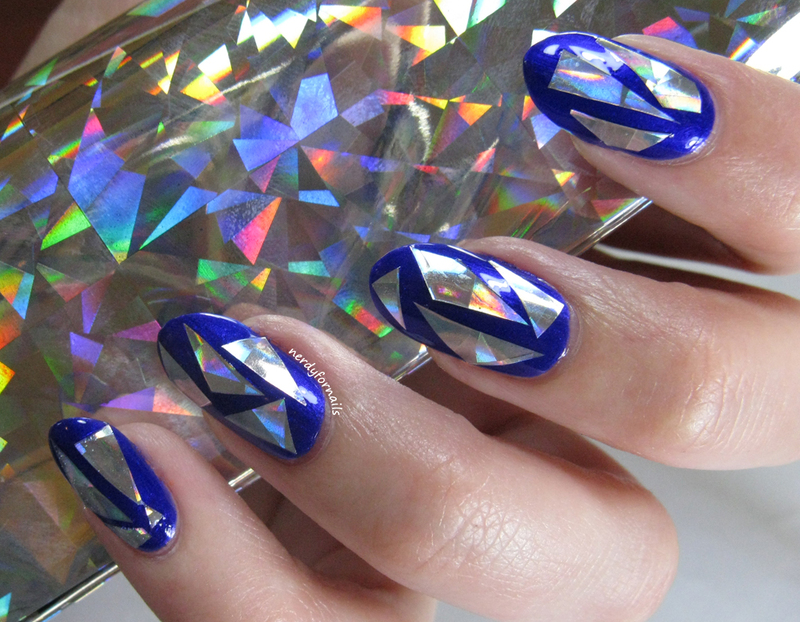 Next, I cut the cellophane into little bits following the shapes that were already outlined by the holo designs. I put top coat on my nails one at a time and stuck on the bits with tweezers to fill in my nails. 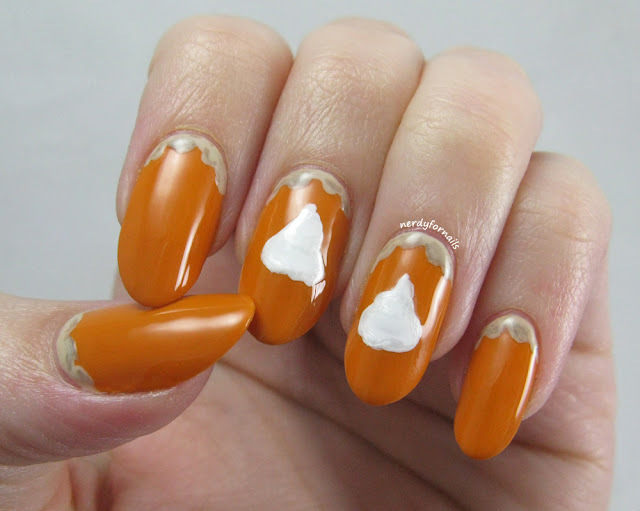 Last I gave it two generous layers of top coat to make sure no corners were sticking up. The cellophane is pretty thin so it was easy to get it to lay flat against the nail unlike some run-ins I've had with mylar shards. What do you think about this trend? Is it something you'd try?